Back to interleague play with these two games in Cleveland, tonight and Wednesday night. Who’ll DH? Charlie has plenty of options. He could “rest” players from playing on defense….Chase, Ryan, J-Roll, Mike Young, Nix. All are candidates. The Phillies will have 15 more interleague games this season following this series. In Cleveland’s Progressive Park, Phillies are 3-3. It’ll be homecoming for Charlie who was a coach and manager for the Indians. In the other dugout are ex-Phillies Terry Francona and Brad Mills. Three former Phillies are on the Cleveland DL: RHP Brett Myers, C Lou Marson and OF Michael Bourn. Dallas Green, along with Alan Maimon, has authored an autobiography through Triumph Books. 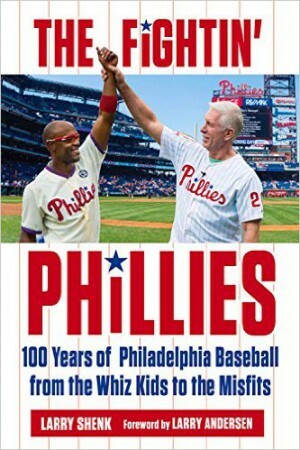 They’ll sign books this Saturday at the Barnes & Noble store, 1901 Sproul Road in Broomall, PA, starting at 11 a.m.
Book will also be available at the Majestic Clubhouse Store in Citizens Bank Park. Dallas will have multiple signings prior to games this season. Will keep you informed. Oh, the title? The Mouth That Roared. Very fitting for the guy called Whispers. **Lehigh Valley lost, 6-2, at Louisville. 2B Cesar Hernandez, 3 hits to boost average to .380; also stole his 6th base. LHP Adam Morgan (1-2) lost, 4 runs in 6 innings. **Reading was rained out at home. **Clearwater allowed 3 unearned runs in the top of the 9th in losing to Ft. Myers, 5-4. RF Kelly Dugan hit 1st home run. **Lakewood lost a pair at Asheville, 11-6 and 10-8. This DateApril 30, 1887—Phillies beat New York, 19-10, in the first game played at Broad and Huntington Streets Park, later known as Baker Bowl. April 30, 1961—Manager Gene Mauch uses seven pinch hitters, five in one inning, as Phillies prevail, 11-7, in 10 innings in St. Louis. For alumni news and photos, visit http://www.phillies.com/alumni. The Big Piece got it going in the Big Apple. Ryan Howard’s two-run pinch double on Sunday sent the Phillies on their way to their first three-game sweep in Citi Field since last September. Howard finished the three days with seven RBI. I his last five games, he now has driven in 10 runs. From Elias: Howard is now hitting .421 (16-for-38) as a pinch-hitter in his career, the highest such batting average among all active players with at least 25 pinch hit at bats. Cole ended his spin with his first win and the first for the Phillies when he’s pitched this season. The Phils were 0-5. Down in Tampa, LHP David Price won his first game, ending the same streak for the Rays, 0-5. Cole and Price are among the elite left-handers in the game these days. Earlier this month, the Phillies took two of three from the Mets at Citizens Bank Park. They scored 17 runs in that series. Following a day off, the offense went into hibernation, scoring a total of 10 runs in their next six games (four losses). Fresh from scoring 18 runs in New York this weekend, the Phillies have a day off Monday before starting a two-game, interleague series in Cleveland on Tuesday night. How will the offense respond this time? **Lehigh Valley won 2 of 3, including a 5-home run game that crushed Louisville on Sunday, 12-7. 1B Darin Ruf, 4-5, 2 doubles, 2 homers, 5 RBI. **Reading’s Jesse Biddle turned in a second straight dominant start on Sunday but didn’t get the decision in a 2-1, 12-inning win. Biddle allowed 0 runs on 1 hit in 6 innings, 3 walks and 10 strikeouts. That’s 26 strikeouts in his last 2 starts. After New Hampshire scored in the top the 12th, the Fightin’ Phils tied the game on a bases-loaded walk and won it when the next hitter was hit by a pitch, forcing in the winning run. NH had won the 1st 2 games of the weekend. **Clearwater won 2 of 3. 3B Maikel Franco had a big weekend, 5-13, 3 homers, 10 RBI. He hit 2 homers and drove in 7 on Friday night. **Lakewood lost, 14-10, at Asheville on Friday night but was rained out the next two days. April 29, 1954—RHP Robin Roberts pitches one-hitter, 4-0, in Milwaukee. Lone hit was by Del Crandall, a double in the third inning. April 29, 1981—Needing three strikeouts to reach 3,000, LHP Steve Carlton strikes out the side in the first inning against the Expos in FOUR minutes at Veterans Stadium. 3B Tim Wallach as #3,000. For more Phillies phlashbacks this week, visit http://www.phillies.com/alumni. There are a lot of numbers that stand out as the Phillies continue to struggle scoring runs and win games. Thursday, the Pirates rallied against Cliff and the bullpen for another late win. In the Phillies last 14 games, they have scored three or fewer runs 11 times. Phillies were 2-16 with RISP in the loss. But, to me, the biggest shocking numbers are 4-11. That’s their record when Cole, Cliff and Doc start. Don’t believe anyone could ever expect that. The good news, the big three are pitching well. The bad news, well, you saw the numbers. For the third straight game, the Phillies had a runner on third with no out. For the third straight game, the next hitter grounded to an infielder and the runner on third was thrown out at home plate. Don’t believe I ever saw that happen before in three consecutive games. Weekend series at Citi Field in New York starts on Friday night . . . Then, on to Cleveland next week . . . Chooch is scheduled to play in Reading 7:05 Friday night and 6:05 Saturday night and then join the big club in the big apple on Sunday. With the Phillies out of town, fans can journey to Reading to see Chooch in action. Tickets are available. Jesse Biddle, Reading’s ace, is listed as the starter for Sunday’s 1:35 p.m. game. **Lehigh Valley lost, 5-1, at Indianapolis, Ethan Martin (1-2). RF Delmon Young, 2-4, in 1st rehab assignment. 3B Cody Asce, 2-4, including 5th double. **Lakewood lost, 12-1, at Greenville. 1B Art Charles hit 3rd homer, one of 2 hits for the BlueClaws. April 27, 2003—RHP Kevin Millwood pitches ninth no-hitter in Phillies history, 1-0, over the Giants at Veterans Stadium. CF Ricky Ledee homers in the first inning and catches the final out. 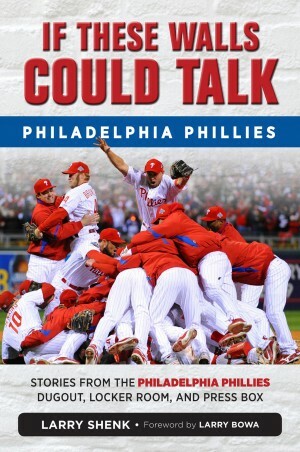 Kevin talks about the no-hitter in a feature written by Paul Hagen at http://www.phillies.com/alumni. Who is the only Phillies player ever to get six hits in six at-bats in a game? Answer is on the Phillies alumni web page. Adams is one of the best eighth-inning relievers in the game and that’s why the Phillies signed him. Wednesday night, he couldn’t hold the lead. A walk started the fateful eighth, which mirrored last year’s nightmares in the same inning. A year ago, Phillies relievers walked 133 in that inning. Up until Wednesday, the bullpen had done its job. But, Bustardo allowed a homer to a left-handed hitter in the seventh cutting the pad to 3-2 before Adams took over in the eighth. Doc turned in another strong outing, Utley and Howard went deep but the offense couldn’t produce more than three runs. Pitchers don’t have any room for error with the low-scoring offense. For the second straight game they had a runner on third with no out but didn’t score. Both times that runner was thrown out on a ground ball. Phillies have given up nine home runs in seven games on this homestand. All nine have been solo . . . Chase’s homer was the Phillies first off a lefty . . . Phillies have grounded into 23 double plays in 22 games . . . Series wraps up with a day game on Thursday . . . Then, a pair of buses will carry the team to New York for a weekend series with the Mets. Pitcher- LHP, Nick Hernandez, Clearwater… 1 start- 1-0, 6.0 IP, 4 H, 1 R, 1 ER, BB, 7 SO vs Brevard County… After missing the last two years with a shoulder injury, Hernandez picked up where he left off prior to injury; in 2010 he allowed 1 ER or less in six of his eight starts for Lakewood… On the year Hernandez is 2-0 in 3 starts with a sparkling 2.12 ERA (4 ER, 17.0 IP)… The young lefty has baseball in his blood; his father, Nicolas Hernandez, a catcher, was selected by the Brewers with the 8th overall pick in the 1978 draft… Furthermore, his Uncle is current MLB umpire Angel Hernandez… The 24-year-old Hernandez was selected in the 12th round of the 2009 draft out of the University of Tennessee. Player- 1B, Art Charles, Lakewood… Batted .423 (11-for-26) in 7 G with 5 R, 3 2B, HR, SB, 6 RBI and 2 BB… After beginning the season in a 2-for-24 (.083) funk, Charles has gone 16-for-41 (.390) to raise his average to .277 for the season… Charles has been a force with runners on in front of him hitting .375 (6-16, 10 RBI) with RISP and .500 (1-2, 4 RBI) with the bases loaded. The 22-year-old Charles was originally selected by the Toronto Blue Jays in the 20th round of the 2010 draft out of Bakersfield College… The Phillies acquired Charles via trade on 2/23/13 for RHP Michael Schwimer. **Lehigh Valley split a pair in Indianapolis. LH Adam Morgan lost the opener, 4-1, allowing all 4 runs in 5.2 innings. 1B Cody Overbeck hit his 5th home in the 6-3 second game win. **Reading edged Harrisburg, 6-5. RH Hector Neris (2-0) won, 8 strikeouts, 5 innings, allowing two solo homers in the fourth for the only runs while he was in the game. **Clearwater won, 9-7, at Tampa. RF Aaron Altherr, 4-5, boosting average to .372; 5th stolen base. C Carlos Ruiz hit a three-run homer in the 1st inning and caught all 9 innings. He’ll come north today and play in Reading Friday and Saturday nights and then join the Phillies on Sunday in NY. **Lakewood also won, 7-5, at Greenville. Every starter but SS Ramon Quinn had one hit. 3B Mitch Walding’s hit was a 3-run double, his 5th. RH Miguel Nunez (2-0) won, 1 run in 5 innings. April 25, 1972—LHP Steve Carlton ties the club record for a LHP with 14 strikeouts in pitching a one-hit, 3-0, shutout in San Francisco. Lone hit was by SS Chris Speier, the Giants’ first batter. April 25, 1978—A big green thing makes its debut….Phillie Phanatic. Looking for Alumni news, features and photos? Visit http://www.phillies.com/alumni. Here’s an idea. Weather is chilly enough to fire up the fireplace. Need some wood? Let’s burn the Phillies bats and get all new ones. For the third time in the last eight games, they were shut out. For the fifth time in Cole’s five starts, they have lost. Never has Cole started a season 0-3 until Tuesday night. A lead-off triple in the fourth and the Phillies don’t score. Hard to believe, Harry. Jeff Locke is the Pirates’ fifth starter and he entered Tuesday’s game with a 5.17. He gave up two hits in six innings. Wednesday night, their ace, Wandy Rodriguez who has a 0.56 ERA, faces the Phillies. Both are left-handed and lefties are giving the Phillies fits. Then again, so are right-handers. From Elias: Michael Young extended his hitting streak to 14 games. The odd thing about Young’s streak: in each of the last 12 games he’s had only one hit, and a single in each case. No other player in baseball’s modern era (1900 to date) has had a streak of 12 games with exactly one hit, a single, in each game. **Lehigh Valley was rained out at Indianapolis. **Reading scored 4 in the ninth, 3 on Zach Collier’s 2nd homer of the season, to win, 7-5, at Harrisburg. **Clearwater pounded out 15 hits but lost, 13-2, at Lakeland before a crowd of 514. Threshers were 4-14 RISP. **Lakewood was 4-0 winner at Greenville as three BlueClaw hurlers combined on a 2-hitter. 2B Angel Mora had one-third of Lakewood’s 9 hits. RH Kevin Brady (1-2) was the winner, 5 no-hit innings that included 5 walks and 5 strikeouts. Kevin Millwood tossed the last no-hitter at the Vet 10 years ago come April 27. Paul Hagen has a feature on Kevin and his historic moment on http://www.phillies.com/alumni. Check it out. For the third straight day, a comment updates us on the first Phillie on a Sports Illustrated cover. Check out Dennis Orlandini’s comment. 22-year-old Pettibone had a credible debut. Two web gems helped him early in the game but he settled down and kept the Phillies in the game. On top of that, he’ll always remember his first at-bat, a walk which turned into his first run scored, coming on a wild pitch. His family was there, Californians not accustomed to cold Philly Aprils. From Elias Sports Bureau: the rookie allowed only two runs and struck out six without issuing a walk. Only two other Phillies pitchers have registered at least six strikeouts without allowing a walk in their major-league debut: Charles Hudson on May 31, 1983 (8 SO against the Dodgers) and Carlton Loewer on June 14, 1998 (8 SO against the Cubs). J-Roll collected his 800th RBI, a sixth-inning single that plated the winning run. The Phillies first two runs came on a wild pitch and a hit-batter. RISP was 2-12, not good numbers. Papelbon closed it out with a save. He’s now 55-for-55 in April saves. Using first names, Jonathan started the game and Jonathan closed the game. It that a first in Phillies history that two Jonathans did that? Utley leads the Phillies with 15 RBI; pinch hitters are second with 10 . . . Phillies are 17-4 vs. the Pirates in the last 21 games at Citizens Bank Park . . . As part of the South Atlanta League All-Star Game festivities scheduled in June at Lakewood’s FirstEnergy Park, a celebrity home run hitting contest will take place on the 17th, the night before the game. Mickey Morandini and Matt Stairs have joined the celebs list. Mitch Williams and Doc Gooden are two others. Tickets are available at http://www.blueclaws.com . . . Happy Birthdays today go to Rheal Cormier, 46 and Carlos Silva, 34. Thanks for the comment posted yesterday by Rick Goldstein. He pointed out the first Phillies player on the cover of Sports Illustrated was Ken Walters in 1961 and not Art Mahaffey in 1963, as I had read on another website. **Lehigh Valley lost its 10:35 a.m. get-away home game, 8-2. All aboard a bus then for a long trip to Indianapolis and a night game Tuesday. Life in the minors: the IronPigs are in the midst of a crazy string of starting times of 6:15, 12:05, 6:15, 12:05, 5:35 (DH); 1:35, 10:35, 7:05 and 11:05. Sleeping and eating routines are not routine. **Reading: LH Jess Biddle turned in a real gem at Harrisburg. He retired the first 19 hitters, 14 on strikeouts, before losing a perfect game with a walk and a single. He struck out 16 in 7 innings and as a hitter, stroked 2 doubles in 3 at-bats. Biddle won, 3-2, with Kyle Simon getting his 5th save. He struck out 1. Harrisburg pitchers fanned 15. Of the 32 strikeouts, 23 were swinging. **Clearwater lost, 2-1, at Lakeland. April 23, 1961—RHP Art Mahaffey sets a Phillies record with 17 strikeouts in a 6-0 win over the Cubs in the second game of a doubleheader at Connie Mack Stadium. RHP Frank Sullivan blanks the Cubs, 1-0, in the first game. Mahaffey’s record still stands. Baseball can be so unpredictable. Friday night, the offense scored eight runs in beating the Cardinals behind Doc. In Cliff’s start the next night, Phillies were shutout for only the 28th time in 741 games at Citizens Bank Park. Saturday night, Cliff, walked three in one inning after allowing only one in his first three starts. Bigger news: Cliff’s modern-era record (since 1900) of at least 6.0 innings pitched with one walk-or-less was snapped at 20 consecutive starts (7/4/12-4/15/3). The previous record was 14 straight, done by Christy Mathewson in 1908 and Greg Maddux in 1997 (source: Elias Sports Bureau). Sunday night, two runs in the first inning and then the Phillies offense went dormant before erupting in the eighth inning for a come-from-behind win which improved their ESPN Sunday Night Baseball record to 26-18. Fresh from sweeping the Braves, the Pirates come to town Monday for a second straight four-game series against a Central Division enemy. Phillies were 3-4 vs. the Bucs a year ago, 2-2 at home. Phillies really struggle at PNC Park, 14-24. Former Phillies on the Pirates? Third base coach Nick Leyva and broadcaster Bob Walk. Dennis Orlandini e-mailed “a totally meaningless trivia note:” When Jonathan Pettibone starts Monday night, he’ll be the first player born in the 1990s to play in a regular season game for the Phillies. His birthday is July 19, 1990. Former Phillies catcher, Gus Triandos, died on March 28 in San Jose, CA. He was 82. Big Gus was the first catcher to catch a no-hitter in each league, Jim Bunning with the Tigers and Phillies . . . From Broad & Pattison.com: On this date in 1963, Art Mahaffey became the first Phillies player to appear on the cover of Sports Illustrated . . . Happy Birthday today: Mickey Morandini, 47. **Lehigh Valley: rained out Friday, lost a DH on Saturday and a single game Sunday. 4-game series with Buffalo ends with 10:35 a.m. game Monday. IronPigs leave after game for Indianapolis. 3B Cody Asche is riding a 5-game hitting streak, lifting average from .162 to .263. **Reading: rained out Friday, split a pair on Saturday and lost on Sunday. RH Kyle Simon recorded 4th save on Saturday. **Clearwater won 2 of 3 games. SS Jose Mojica is riding a 6-game hitting streak, 14-21, boosting his average to .500. OF Aaron Altherr, 4-9 on the weekend, hiking average to .328. **Lakewood: dropped 2 of 3 to Savannah. 1B Art Charles, 6-12, on the weekend, going from .226 to .277. No Walk Streak: When Will It End? Returning to friendly Citizens Bank Park, the Phillies bats showed some life. But, an eighth-inning homer by Beltran handed the Phillies a one-run loss, even though they out-hit the Cardinals, 13-7 (11 singles, two doubles). For Beltran, that’s four homers in his last 11 games at Citizens Bank Park. For the seventh straight game, the Phillies failed to score in innings one through five. That’s hard to do. Down, 2-0, they tied it in the sixth. Down, 3-2, they tied it in the seventh. In the last of the ninth, the Phillies had runners on second and third with one out but didn’t score. That’s hard to do. But, once again, they didn’t draw a walk. Their last one was an intentional walk on Sunday, that’s 135 plate appearances. That’s also hard to do. When will it end? The Cardinals had three walks and one scored. When it comes to reaching out to the community, the Phillies players excel. This weekend, three will be purchasing tickets for groups: Friday–Charlie’s Lineup (Covenant House Pennsylvania); Kendrick’s Krew (Bancroft School) and Saturday–Hamels’ Heroes (Wounded Warrior Project) . . . Don’t forget Sunday’s game is 8:05 and will be on ESPN TV. http://www.phillies.com/alumni has a feature on John Kruk who is now part of the Sunday Night ESPN broadcasting team . . . Happy Birthday: Tommy Hutton, 67, on Saturday; Greg Legg, 53, on Sunday. **Lehigh Valley pounded out 18 hits in romping over Pawtucket, 14-5. 3B Cody Ashe, 4-6. Cody Overbeck, 3rd homer, a grand slam. No decision for LA Adam Morgan, 5 innings, 1 hits, 1 run, 4 strikeouts. Needed 100 pitches to get through 5 innings. **Reading lost, 7-1, at Richmond. 1B Jim Murphy, 3rd HR. **Clearwater dropped a 5-2 decision to Brevard County. 2B Carlos Alonso had one-third of Clearwater’s nine hits. **Lakewood nipped Savannah, 3-2. 3B Mitch Walding, singe, 3rd double, RBI. April 19, 1900—Phillies win in Boston, 19-17, in 10 innings, the highest scoring opener in NL history. Boston scored nine in the bottom of the ninth to send the game into extra innings. April 20, 1989—3B Mike Schmidt’s first-inning double in Pittsburgh off Mike Dunne breaks Richie Ashburn’s club record for career hits (2,217). April 21, 1898—RHP Bill Duggleby hits a grand slam home run in his first major league plate appearance (2nd inning) in a game in New York. Thanks to Dennis Orlandini for his comments about the Phillies Yearbook history. Yes, we considered ending it one time because it just didn’t sell as it had done in the past. But, I didn’t want the end to happen on my watch. I believe only the Yankees have a longer run in producing Yearbooks. If anybody knows that, post a comment. Comments are always welcomed, pro and con. Two of the losses came Wednesday, the quickest imaginable. The 0-0 suspended game from Tuesday resumed in the bottom of the ninth. It took the Reds nine minutes to score the winning run. In the regularly scheduled game, the Reds scored five in the second inning on their way to a 11-2 romp. **8-39 with runners in scoring position on the trip. **0 runs scored in innings 1 through 5. **last four home runs have come from players who were not in the starting lineup. **starting lineup combined for 3 RBI on the trip; Young had the last one on Sunday. **Going back to the last home game, April 10, Utley, Brown and Young are the only starters to drive in a run. Someone once said, you are never as good as you look when you are going good and never as bad as you look when you are going bad. The offense produced much better in the six home games this season. Well, the next eight games are at Citizens Bank Park. Series sweep by the Reds over the Phillies was their first since 1996 . . . Last Phillies suspended game was Game 7 of the 2008 World Series. For the regular season, August 9, 1982, at Pittsburgh . . . The 2013 Yearbook will be on sale starting Thursday night. Phillies first Yearbook was published in 1949 . . . Birthdays today: Rico Brogna, 47 and Jim Eisenreich, 54. **Lehigh Valley dropped an 8-1 decision at Pawtucket. 1B Darin Ruf, 1st home run, one of three LV hits. **Clearwater, after crushing Daytona Beach, 15-6, on Tuesday, the table was turned on the Threshers, 13-2. RF Cameron Perkins, 2nd HR. **Lakewood was held to five hits in losing, 3-1, at Hagerstown. April 18, 1979—LF Greg Luzinski becomes the first visiting player to hit a home run into the upper deck in Pittsburgh’s Three Rivers Stadium. Don’t forget to check http://www.phillies.com/alumni for more phlashback moments. That’s been the story of the offense on this road trip. In the six previous home games, the Phillies scored 33 runs. So far in four road games, eight. Including last night’s 0-0 game suspended in the bottom of the ninth, the offense has yet to score in the first through the fifth innings of any of the five games on this trip. Starting pitching has been excellent on the trip, including Kyle last night. Pitcher– LHP Adam Morgan, Lehigh Valley… In two starts- 1-0, 1.29 ERA (2 ER, 14.0 IP), 9 H, 2 BB, 9 SO for the week… 4/12 vs Syracuse- W, 8 IP, 3 H, 1 BB, 4 SO, his first triple-A win in only his eighth start above single-A… 1-for-3 as a hitter, first-career RBI… Morgan faced 28 batters on the night; recording 22 four-pitch outs … Retired the lead-off hitter in all 8 IP, topping out at 93 on the gun… Honored by the International League as the IL Pitcher of the Week for the week of April 8-14… The 23-year-old lefty was a 3rd round selection in the 2011 draft out of the University of Alabama and signed by Mike Stauffer. Player– 1B Jim Murphy, Reading… Batted .381 (16-for-42) in 10 G with 8 R, 5 2B, 2 HR and 10 RBI… .545 with RISP (6-for-11)… After a hitless, 0-for-4 Opening Day, Murphy roared back with a nine-game hitting streak which is currently tied for the longest active streak in the Eastern League… At time of print, Murphy is in the lead or tied for the organization lead in runs, hits, total bases (27) and multi-hit games with six… The 27-year-old was a 17th round selection in 2006 out of Washington State University and signed by Dave Ryles. **Lehigh Valley: Tommy Joseph, Cody Overbeck and Leandro Castro homered in an 8-6 win at Pawtucket, Jacob Diekman (1-0) in relief; 1st save for Michael Stutes. **Reading: Albert Cartwright was 3-4, boosting his average to .354, as Reading edged Harrisburg, 4-3, in 10 innings. **Clearwater: Every player in the lineup had at least two hits as the Threshers pounded out 27 hits in a 15-6 romp over Daytona Beach. SS Jose Mojica led the parade, 5-5. **Lakewood: Two-game winning streak ended in Hagerstown, 11-2. Mitch Walding had 3 of Lakewood’s nine hits. **Interesting note in Jerry Crasnick’s ESPN.com story about Bobby Abreu: “Abreu needs 13 homers and one stolen base to be a 300-400 man. Barry and Bobby Bonds are the only other players with at least 300 career homers and 400 steals.” The story went on to explain Bobby will play winter ball after the season and then try to hook on with a major league club. Didn’t want to retire right now. Once his career is over, Bobby is a sure bet for the Phillies Wall of Fame. **Happy Birthday to infielder Solly Hemus, who turns 90 today. Solly played for the Phillies from 1956-58 . . . Birthday wishes, too, to catcher Gary Bennett, 41. **What happened during the Phillies season 110 years ago? New story appears on http://www.phillies.com/alumni.